Plantar fascists can make walking intolerable. One of the most common causes of heel pain, plantar fasciitis is an ailment that results from a swollen or weak plantar fascia in the foot. It is the tissue that connects the heel to the toes. Inflammation, irritation and weakness can lead to pain each time you take a step. The worse the condition becomes, the more walking or running may seem intolerable. Plantar fasciitis is typically the result of constant strain to the tissue which can happen if you roll your feet inward when you walk. It is also the result of wearing high heels, shoes that are not a proper fit or when you are excessively overweight. 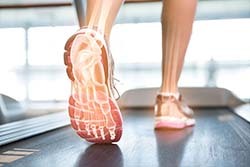 Running on hard surfaces does not help the tissues in and around your foot either and it may be the cause of plantar fasciitis for some runners. Experiencing pain when you take your first few steps of the day or after sitting for a long time are telltale signs. If the stiffness or pain goes away after a few steps, this is another indication. Do not mistake that stiffness for something benign. This could be that your symptoms are not as severe yet, but if you don’t treat the condition it will get worse. Rest can help if you are looking for short-term relief for foot related sports injuries. If you are constantly walking or running around, you may need to cut back on those activities temporarily. Placing an ice pack on your heel can also help while over the counter pain medication will assist you in relieving some of the immediate symptoms. However, these measures will not alleviate the condition as a whole. If you are looking to heal your symptoms naturally, sports medicine is a great option. Dr. Bob Meyer, has over 21 years of experience as a sports medicine doctor and treating patients with chronic pain including plantar fasciitis. He can help develop a sports injury treatment plan that will get you back on your feet fast.